Wholesale Trader of a wide range of products which include reebaklens mortar removal, reebaklens rr rust remover, reebol, concur wb standard white, concure wb white curing compound and reebol emulsion xtra mold release agents. Uses For the removal of mortar and plaster runs, droppings and stains from brickwork and concrete surfaces. Also for removal of hardened concrete from tools, machinery and equipment, or rust and mill scale from steelwork. 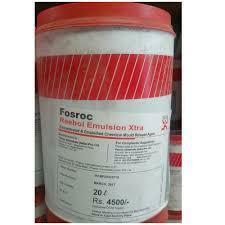 Suitable for etching of concrete floors and surfaces prior to application surface coatings. Advantages Rapid action Safe with metals (except zinc and galvanised steel), wood, glass, plastic and rubber. No corrosive action. Penetrates oil and grease. Description Reebaklens is a combination of acid based material, corrosion inhibitors and dispersing agents and is supplied as a clear blue solution. Technical Support Fosroc provides a technical advisory service to specifiers, end-users and contractors as well as on-site technical assistance in locations all over the country. Properties Specific gravity : Typically 1.08 at 250 C.
Uses Reebaklens RR is used as a rust remover from steel bars prior to encasing in concrete / microconcrete. It can also be used on ohter steel surfaces prior to coating with epoxy systems. Advantages Rapid action Safe with metals (except zinc and galvanised steel), wood, glass, plastic and rubber. No corrosive action. Penetrates oil and grease. 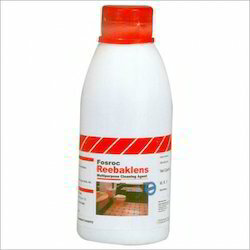 Description Reebaklens RR cleaning agent is a combination of acid based material, corrosion inhibitors and dispersing agents and is supplied as a clear green solution. Technical Support Fosroc provides a technical advisory service to specifiers, end-users and contractors as well as on-site technical assistance in locations all over the country. 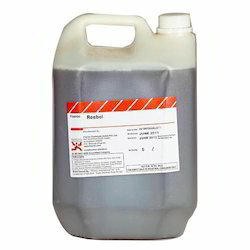 Properties Specific gravity : 1.16 - 1.22 @ 250 C Application instructions For rusted metal (iron base) Apply Reebaklens RR with brush for complete wetting of rusted metal surface and allowed to react it for 16-24 hours. After 24 hours, a white layer will appear which will protect further corrosion of metal / steel for about 5-7 days. Before applying protective coating, the surface should be wire brushed and thoroughly cleaned for dust with dry cloth. Uses To provide quick, clean and easy stripping of moulds, and formwork and ensure high quality fair-faced and stain-free concrete. Advantages „ Ensures easy release, good fair-faced concrete „ Can be used on all types of formwork „ Minimises surface blemishes and staining „ Minimises cleaning of shutters before re-use „ Reduces opportunity of damage to formwork, extending usable life. Description Reebol is specially formulated blend of mineral oils and chemicals having release properties which are superior to those of a conventional mould oil. The chemicals react with the alkali in the concrete to form a thin water repellent skin on the surface of the mould, thereby enabling easy striping from concrete and acting as a protection to steel and wooden formwork. Reebol is supplied as a pale straw coloured liquid ready for direct application and use. 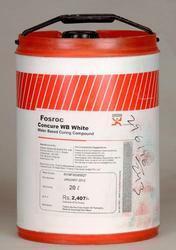 Technical Support Fosroc provides a technical advisory service supported by a team of specialists in the field. With the help of highly skilled professionals, we are engaged in offering a qualitative assortment of Concur WB Standard White. This is the widely trusted film forming, the curing agent that can be applied as a spray membrane to retain moisture in concrete. Further, the cost saving curing agent is suitable for large area concrete surfaces like airport runways, roads, and bridgeworks. Concur WB is water based concrete curing compound based on a low viscosity wax emulsion. It is supplied as a white emulsion which forms a clear film on drying. 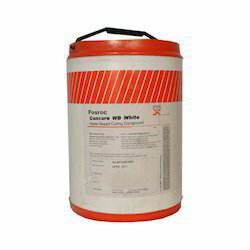 CONCURE WB WHITE Packing Available In 5 lt./20 lt./200 lt. Uses For easy and stain free release of concrete moulds and formwork of all types. Particularly where wooden formwork is used and de-moulding or stripping times exceed 24 hours. Advantages „ Non-staining : No cleaning of unsightly oil stains if plastering is not required. „ High quality : Produces really fair faced finish concrete. „ Versatile : Can be used on all types of moulds. „ Minimises cleaning : Makes cleaning of form faces between pours very easy. „ Concentrate form : Reduces storage and transport costs. „ Water based : Only requires water for dilution. „ Aids corrosion inhibition Description Reebol Emulsion Xtra is supplied as a pale amber liquid which turns white when diluted with water to produce a chemical release agent, combining the outstanding release properties of such materials with the economy of a conventional oil. It reacts with the alkali in the concrete to form a thin water repellent skin on the surface of the mould which enables easy stripping from the hardened concrete. Technical Support Fosroc offers a comprehensive range of high performance, high quality concrete repair and construction products. In addition, Fosroc offers technical support service to specifiers, end-users and contractors, as well as on-site technical assistance in locations all over the country. Looking for Surface Treatment Compound ?